I love gardening. I know that this statement is pretty obvious, but I'm not sure if you understand how much I enjoy gardening. Mowing the lawn is one of my favorite chores. I can get lost in time trimming trees. I start to get a little giddy in the fall, anticipating the hours that I get to spend spreading seed and shoveling manure to put in a winter lawn. If I go for a couple of weeks without doing yard week or gardening, I start to feel like I'm losing my soul. So when my eight year old daughter recently read The Secret Garden and then could not keep herself out of the garden, my heart beat with the joy of 1,000 angels singing. She has been weeding, digging, planting, watering, and doing whatever she can in the garden day in and day out. So of course a Renaissance Dad wants to continue to encourage this type of behavior. Behind this row of oleanders...will be a secret place. Enter the corner of my yard. We have a row of oleanders at the back of our yard, and behind them is my workshop. There is a small triangular hunk of wasted space sitting back there. I have always thought about this as a great place for raising chickens, if and when my city ever lifts their ban on chickens (don't get me started on that one). But my wife and I started talking about this little corner. What if we made it a secret garden for the kids? What if this became the area where they could dig and plant whatever they wanted? What if the kids had a place to make mud pies, look for worms, grow and pick as many flowers as they wanted. And what if I pulled out an oleander or two and built a secret door for their secret garden? 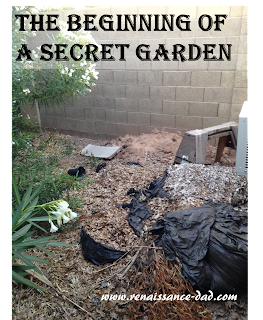 So while the secret garden is merely in its infancy, I could not contain my excitement to share the early stages of this project. 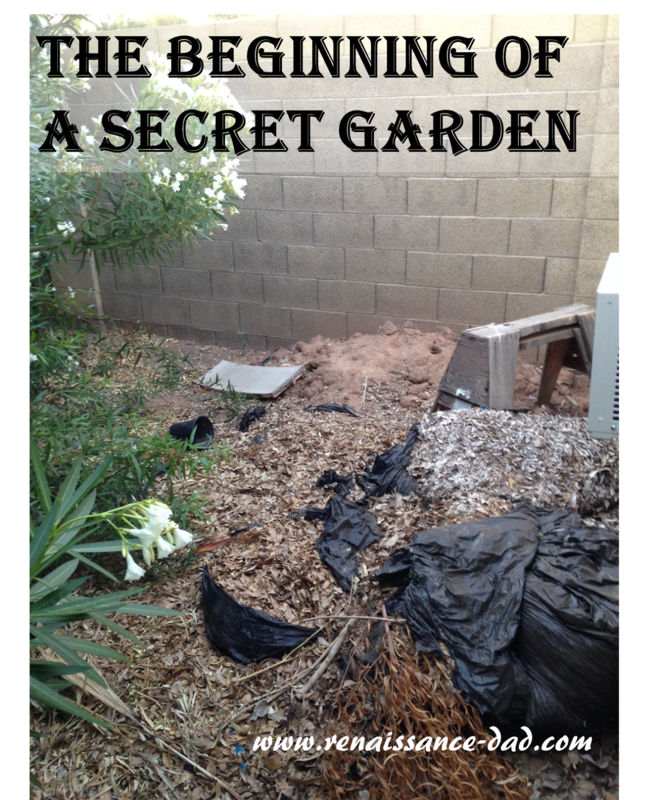 Stay tuned for the next phase of The Secret Garden project. Love it! I'll be keeping an eye out. We've talked a lot about something similar for our kids.